If you solved our puzzle post last week we are ready to let you know the rest of what we are up to. ANOMALIA 2013 Short Film Making II. with Anthony Wong from ANOMALIA on Vimeo. We are very excited to partner with Anomalia and announce this special advanced summer production course for rigging in Maya. 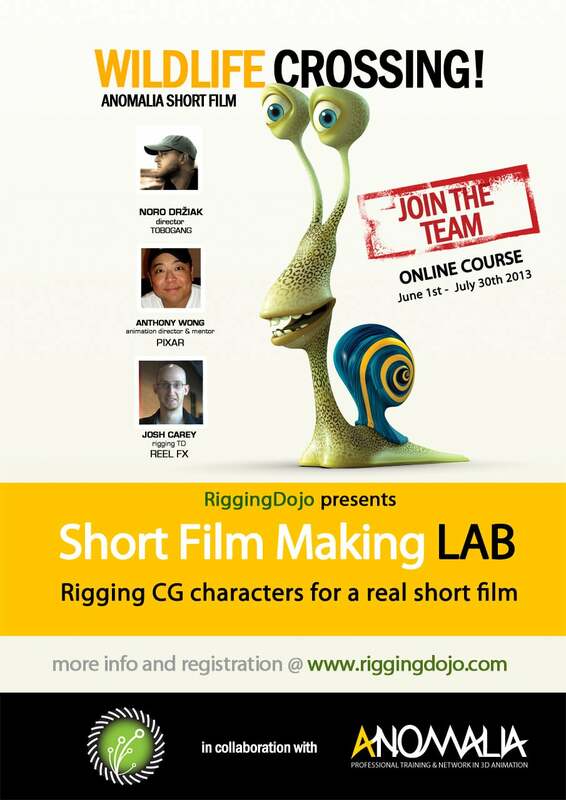 Artists that are chosen for the workshop get to learn from a large group of mentors through production level feedback and supervision, as they learn and build cartoon rigs that will be used for the ANOMALIA 2013 Short Film Making II. with Anthony Wong of Pixar workshop. Josh Carey from Reel FX and Rigging Dojo, who is teaching on site for the Anomalia cartoon rigging workshop in September, will lead this special online course in June along with a crew of TD mentors from Rigging Dojo. Students get production-style critique and guidance and access to training and mentoring, while creating really fun rigs in Maya along with film credit and access to all the other Rigging Dojo Alumni extras once the course is complete. Check your email for the newsletter for your chance to register.